A City of Delaware street crew works on subsurface repairs to a section of East Central Avenue on Monday. The Central Avenue project will continue through August. Subsurface construction work on Central Avenue from Troy Road to The Point began Monday and is expected to last through August. Workers will be on the road beginning at 6 a.m. Monday through Thursday. It is anticipated the workers will be finished by 4 p.m. each day when traffic reaches its heaviest points, and no work will be done on Fridays for the same reason. According to a press release from the City of Delaware, two-way traffic will be maintained throughout the work zones and will be directed by flagging operations. 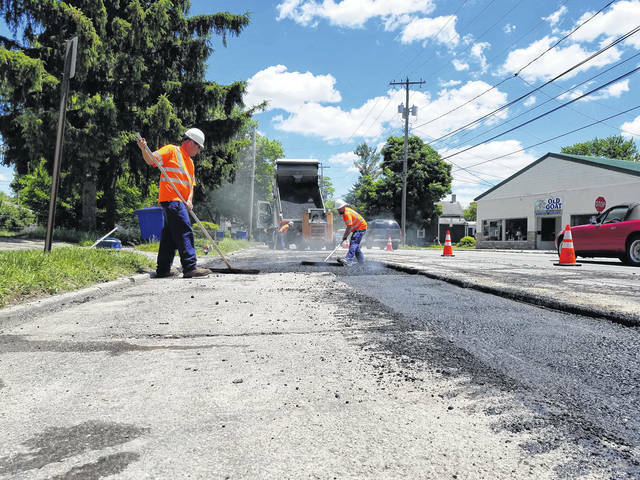 The project comes ahead of the Ohio Department of Transportation’s scheduled replacement of Central Avenue’s top surface in 2020. Until those significant improvements can be made, he said the city will “squeeze as much life out of the new surfacing as we can,” while it continues to work toward finding the funding for a complete rebuild. Yoakum didn’t anticipate any total reconstruction happening in the next three to five years. The city plans to utilize grant money to help fund the eventual reconstruction. However, the grants require a local matching financial contribution and Yoakum speculated the city’s contribution could very well exceed $1 million dollars. For now, while the search for funds continues, the city is working through the initial progressions. When asked how long the temporary fixes can be expected to hold up, Yoakum gave the most recent resurfacing project on Central Avenue in 2010 as a reference point.